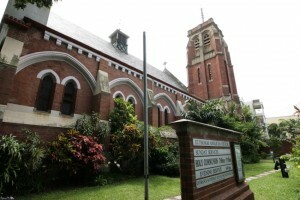 St Thomas’ is a joyful, thriving Anglican church in the centre of Durban’s beautiful Berea. Here we aim to express our love for God and neighbours in all that we do, and to help people discover for themselves the significance of Jesus Christ. What will you be doing for Mandela Day? Here are some ideas on his centenary, celebrating Mandela day for 100 days! Have YOU registered for Anglicans Ablaze yet? We also have a traditional service on Wednesdays at 9:30am and an informal service on Wednesdays at 5:30 pm at the original site, fondly known as Old St. Thomas. The last Wednesday of the month is dedicated to our Healing Ministry at both of these services. Please feel free to join us for worship at one of our services. Visit our news page for birthdays, our diary and events that are coming up. Please contact the office for more information: Tel 031 201 2204. Click here to find out more about the history of our beautiful church..